For homework I had to play a spelling game. I was trying to think of a game, and then 10 fast fingers popped in my head. 10 fast fingers is a spelling game that I love playing. My highest score was 37, and I would always try my best to beat that score. Today was the day, that I beat my score. I was so proud of myself, that I had to take a screenshot. 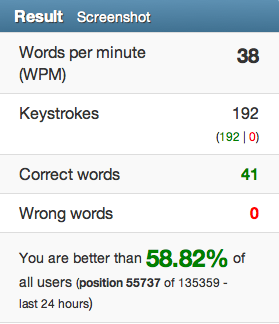 Before I got this score, I had to replay over and over again until I beat 37 correct words. When I saw 41 correct words, I didn't want to play another game because I was tired of spelling words. My highlight was finally getting a high score.